Choose a strong leather dog harness for training and control. Colors: black and brown. 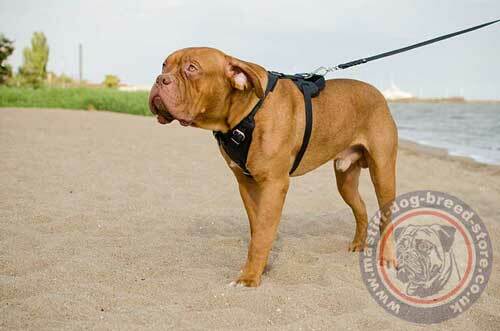 Dogue De Bordeaux harness is designed to be incredibly strong and comfortable for both the dog and handler. 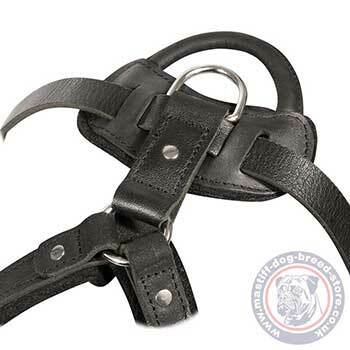 Strong dog harness is made of thick genuine leather of top quality. The edges are reliably polished and waxed to prevent wearing out for a long time. Strong dog harness is intened for regular active use. That's why each detail is done with maximum attention and care. Dogue De Bordeaux harness is handmade by experienced craftsmen. Each strap and plate is carefully designed for maximum functionality in training and prevention of rubbing dog's skin. The front triangle plate and back plate are padded with soft felt. Strong dog harness for dog training is supplied with rustproof nickel-plated hardware. 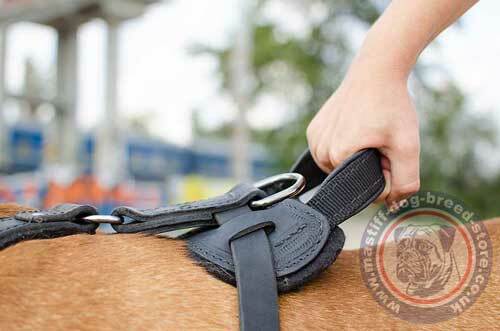 The buckles help to regulate the size of the harness in the definite span. 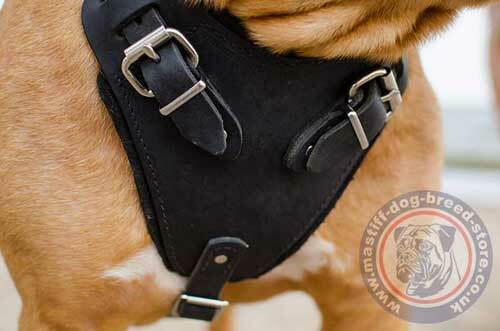 There is also a quick release buckle to turn the harness on/off easy once it is perfectly adjusted to dog's size. You do not have to release all the buckles each time. There is also an option of handle at the back for a better control over your dog. Turn your attention, that the leather we use is well-done, thick, soft and flexible. It is 3.5 mm thick for super durability. Genuine leather is probably the best material for dog accessories, as it is natural, soft, strong and hypoallergenic. You may read the general rules for leather items care at our article. Extra strong dog harness is super comfortable to train a large, strong dog like Dogue De Bordeaux and manage its temperament in walking.